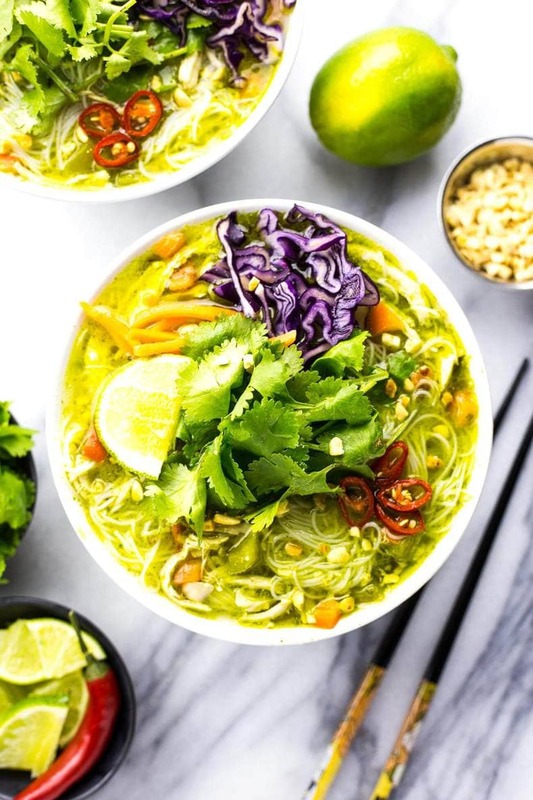 These Thai Green Curry Chicken Vermicelli Bowls are a delicious, spicy noodle soup - flavoured with peanut butter and coconut milk, you'll love this elevated weeknight dinner idea! Cook vermicelli noodles according to package directions in a large pot of boiling water. Drain, remove vermicelli and set aside. In the same pot, heat olive oil over med-high heat. Add chicken (whether fresh or leftover shredded) and saute for 2-3 minutes. Add garlic, ginger, curry paste and peanut butter. Saute another 1-2 minutes. Add coconut milk and chicken broth, bringing mixture to a boil and then simmering for 10 minutes. Add lime juice, salt, carrots and red pepper. Cook for 2 min. Add vermicelli noodles and mix well. Serve in large bowls, then top with shredded red cabbage, chopped peanuts, cilantro and red chilies. Serve and enjoy! This recipe can also be packed as leftovers in large mason jars - they'll be good up to 3 days in the fridge!